This Newsletter is FULL of important information about recital (ticket sales start tomorrow!) – please read it thoroughly and keep it for your reference. Recital Tickets Go On Sale April 2! Click Here to view the guide about how to purchase tickets and redeem complimentary tickets for enrolled students! Sales start April 2 at 10 AM (Central time zone). Father Daughter Dance – Sign Up Today! Click Here to learn more about the Father Daughter Dance and sign up to participate! Don’t miss out on the chance to learn more about the activity your daughter loves by learning, rehearsing, and performing with her! Local businesses can get their products and services in front of hundreds of local families by advertising in our recital program. Program ad purchases help us provide top-notch professional performance experiences for our students! See the order form here – and please share it with any local businesses that you think would benefit from getting their name out in front of our audience! Give Your Dancer a Shout-Out in the Recital Program! Share a message of encouragement with your dancer in their keepsake recital program! See the order form here. Summer Dance Camps, Clinics, and Intensives – Early Bird Pricing ends TODAY! Today’s the last chance to register for summer camps, clinics, and intensives with discounted early bird pricing! Click here to register. Dance Pathways Meetings are THIS Saturday! Dance & Discover Program – Ages 2 through kindergarten, with or without previous experience. Level 1 – First through third graders with previous dance experience. Learn about the variety of styles offered and how participation in dance and different styles of dance can help your dancer reach their goals. Beginners of All Ages! – Learn about opportunities for beginning dancers of all ages – ages 6 through adult! Graded Technique & Specialty Classes – for Second graders and up with previous dance experience. 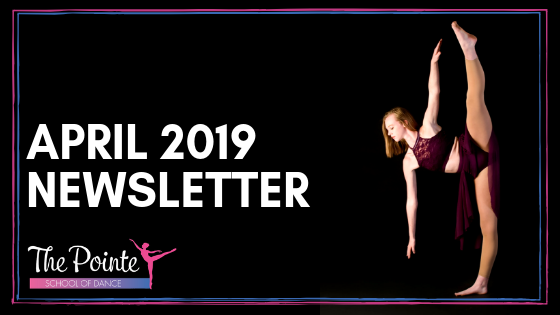 Learn more about our nationally recognized curricula and opportunities for dancers (teacher assistant program, National Honors Society, trips to NYC, etc) as they progress through our curriculum. Performing Groups @ The Pointe – Competitive and Community Performance teams provide opportunities for additional performances, teamwork with other dedicated dancers, and extra work with our instructors for dedicated dancers ages 6 and up! Dancers enrolled at The Pointe for the 2018-2019 season AND Summer 2019 have the first opportunity to register through April 5. Register easily online by replying to that email, logging in online, or stopping by the front desk. Dancers taking the summer off have pre-registration open starting April 6. Registration opens to the community on April 15! Check out our March Dancers of the Month and senior feature here!